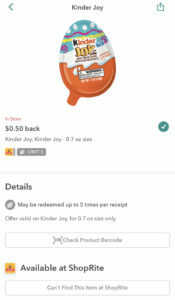 ShopRite: Kinder Joy Eggs Singles JUST $0.25 Each Thru 4/20! 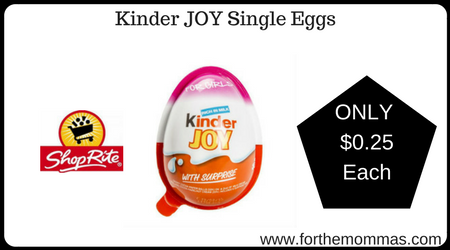 This week thru 4/20, ShopRite has Kinder JOY Single Eggs priced at only $1.25 each. Combine this price with Kinder JOY coupon and a ShopRite coupon to further reduce the price. Plus, you can earn a ibotta rebate to make your final price ONLY $0.25 each!